By the first week of January 1942 the American and Filipino troops withdrawing from both ends of Luzon had joined at San Fernando and begun the last lap of their journey to Bataan. In ten days they had retired from Lingayen Gulf and Lamon Bay to Guagua and Porac, on the two roads leading into Bataan. There they had halted and established a line only fifteen miles from the base of the peninsula. The longer they could hold, the more time would be available to prepare the final defenses in Bataan. Along the ten-mile line from Guagua to Porac, paralleling the road between the two barrios, General Wainwright had placed the 11th and 21st Divisions (PA), as well as armor and cavalry. (Map 9) On the left (west), around Porac, was the 21st Division with the 26th Cavalry (PS) to its rear, in force reserve. On the east was the 11th Division, its right flank covered by almost impenetrable swamps crisscrossed by numerous streams. In support of both divisions was General Weaver's tank group. The troops along this line, the best in the North Luzon Force, though battle tested and protected by mountains on the west and swamps on the east, felt exposed and insecure. They were convinced that they were opposing the entire Japanese 14th Army, estimated, according to Colonel Mallonée, to number 120,000 men.1 Actually, Japanese strength on Luzon was about half that size, and only two reinforced regiments with tanks and artillery faced the men on the Guagua-Porac line. From Cabanatuan, where Homma had moved his headquarters on New Year's Day, 14th Army issued orders to attack the line before Bataan.2 A force, known as the Takahashi Detachment after its commander, Lt. Col. Katsumi Takahashi, and consisting of the 9th Infantry (less two companies), two batteries of the 22d Field Artillery, and the 8th Field Heavy Artillery Regiment (less one battalion), was to strike out from Angeles along Route 74, smash the American line at Porac, and go on to seize Dinalupihan, an important road junction at the entrance to Bataan. To support Takahashi's drive down Route 74, Homma ordered the 9th Independent Field Heavy Artillery Battalion, then approaching Tarlac, to push on to Porac. The Japanese expected to smash the defenses before Bataan easily and to make quick work of the "defeated enemy," who, in General Morioka's striking phrase, was like "a cat entering a sack. "4 General Homma fully intended to draw the strings tight once the Americans were in the sack, thereby bringing the campaign to an early and successful conclusion. He was due for a painful disappointment. 23d Infantry. But darkness fell before the attack could be mounted and the 2d Battalion, 23d Infantry, the unit selected for the counterattack, was ordered to move up at dawn and restore the line on the left. When the 2d Battalion moved into the line, the 21st Infantry would regroup to the right, thus shortening its front. That night the stillness was broken only by fire from the Philippine artillery which had pulled back about 600 yards. When morning came the enemy was gone. 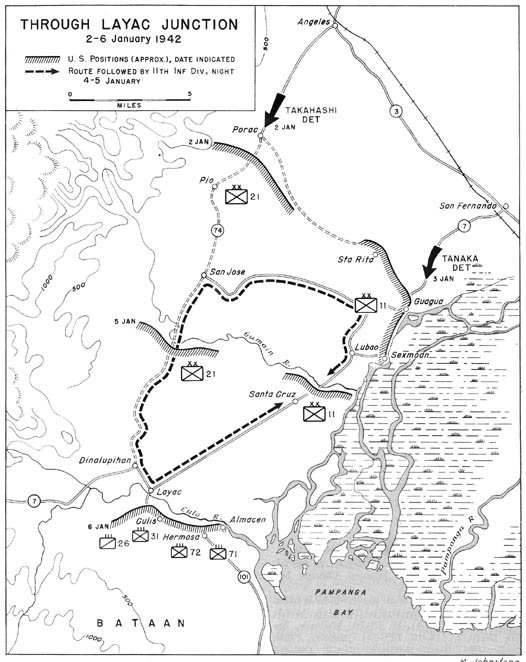 Reports from 21st Infantry patrols, which had moved forward unmolested at the first sign of light, encouraged division headquarters to believe that the original main line of resistance could be restored without a fight and orders were issued for a general advance when the 2d Battalion, 23d Infantry, tied in with the 21st Infantry. American plans for a counterattack were premature. The evening before, the main force of the Takahashi Detachment had left its assembly area midway between Bamban and Angeles and marched rapidly toward Porac. The 8th Field Heavy Artillery Regiment (less one battalion), with its 105-mm. guns, had accompanied the force and by morning was in position to support the infantry attack. Thus, when the 2d Battalion, 23d Infantry, began to advance it was met first by punishing small-arms fire from the infantry, then by fire from the 105-mm. guns of the 8th Field Artillery. At the same time three Japanese aircraft swung low to strafe the road in support of the enemy attack. The momentum of the advance carried the Japanese below Pio, where they were finally stopped. When news of the attack reached General Wainwright's headquarters, the most alarming item in the report was the presence of Japanese medium artillery, thought to be heavy guns, on the left of the American line. This artillery represented a serious threat, and the 21st Division was ordered to "hold the line or die where you are. "8 General Capinpin did his best, but he had only two battalions of the 23d Infantry, an unseasoned and untrained unit, left in reserve. One of these battalions was in North Luzon Force reserve and it was now ordered to move to the 11th Division sector near Guagua where a heavy fight was in progress. Meanwhile, Colonel Takahashi had launched an assault against the 21st Infantry. First the battalion on the left gave way and within an hour the reserve line also began to crumble. By noon the left flank of the 21st Infantry was completely disorganized. The right battalion, though still intact, fell back also lest it be outflanked. This withdrawal exposed the left flank of the 22d Infantry on its right. Quiet settled down on the 21st Division front that night. The Takahashi Detachment, its attack halted by the effective fire of the artillery, paused to reorganize and take stock of the damage. The next day, 4 January, there was no action at all on the left and only intermittent pressure on the right. The Japanese did manage to emplace one or two of their 105-mm. guns along the high ground to the west and during the day fired on the rear areas. Fortunately, their marksmanship was poor and although they made life behind the front lines uncomfortable they inflicted no real damage. On the afternoon of the 4th, as a result of pressure on the 11th Division to the east, General Wainwright ordered the 21st Division to withdraw under cover of darkness to the line of the Gumain River, about eight miles south of Porac. That night the division began to move back after successfully breaking contact with the enemy. Despite the absence of enemy pressure there was considerable confusion during the withdrawal. By daylight of the 5th, however, the troops were across the Gumain where they began to prepare for their next stand. Division headquarters, the 23d Infantry, the division signal company, and other special units were at Dinalupihan, with the 21st Field Artillery located just east of the town. During this action Company A, 192d Tank Battalion, and elements of the 11th Division attempted to counterattack by striking the flank of the Japanese line before Guagua. This move almost ended in disaster. The infantry on the line mistook the tanks for enemy armor and began dropping mortar shells on Company A, and General Weaver, who was in a jeep attempting to co-ordinate the tank-infantry attack, was almost hit. The mistake was discovered in time and no serious damage was done. When news of the Japanese breakthrough at Guagua reached General Wainwright on the afternoon of the 4th he decided it was time to fall back again. The next line was to be south of the Gumain River, and orders were issued to the 11th, as well as the 21st Division, to withdraw to the new line that night. General Brougher's plan of withdrawal called for a retirement along Route 7 through Guagua and Lubao to the new line. The rapid advance of the Tanaka Detachment through Guagua and down Route 7 toward Lubao late that afternoon, however, cut off this route of retreat of the 11th Infantry and other elements on the line. A hasty reconnaissance of the area near the highway failed to disclose any secondary roads or trails suitable for an orderly retirement. To withdraw cross-country was to invite wholesale confusion and a possible rout. The only course remaining to the cutoff units was to traverse a thirty-mile-long, circuitous route through San Jose, in the 21st Division sector, then down Route 74 to Dinalupihan. There the men would turn southeast as far as Layac Junction and then north along Route 7 to a point where they could form a line before the advancing Tanaka Detachment. That evening, 4 January, the long march began. Those elements of the 11th Division cut off by the Japanese advance, and Company A, 192d Tank Battalion, reached San Jose without interference from the enemy but not without adding to the confusion already existing in the 21st Division area. Meanwhile at San Jose, General Brougher, the 11th Division commander, had collected all the trucks and buses he could find and sent them forward to carry his men. With this motor transportation, the 11th Infantry was able to take up a position along Route 7, between Santa Cruz and Lubao, by about 0600 of 5 January. This line was about one mile southwest of the Gumain River, the position which the division had originally been ordered to occupy. Troops arriving on this line found themselves under small-arms fire from the Tanaka Detachment, which had entered Lubao the previous evening. A short distance north of this line, an outpost line had already been established the previous afternoon by General Brougher with those troops who had been able to withdraw down Route 7. The infantry troops on this line were from the 12th Infantry, part of which had pulled back along Route 7. Brougher had rounded up about two hundred men from the regiment, together with the ten guns of the 11th Field Artillery and some 75-mm. SPM's, and formed a line on Route 7 between Lubao and Santa Cruz. For fourteen hours, from the afternoon of 4 January to the morning of 5 January, these troops under the command of Capt. John Primrose formed the only line between the enemy and Layac Junction, the entrance into Bataan. Early on 5 January when the new line was formed by the troops who had withdrawn through San Jose, Primrose and his men pulled back to join the main force of the division. at a block along the Sexmoan-Lubao road. At about 1600 Peck and Miller had observed a large enemy force approaching. This force, estimated as between 500 and 800 men, supported by machine guns, mortars, and artillery, was led by three Filipinos carrying white flags, presumably under duress. The tanks and SPM's opened fire, cutting the Japanese column to pieces. The 194th Tank Battalion then left burning Guagua and Lubao and moved south to positions a mile or two above Santa Cruz. The tanks and SPM's at the block covered its withdrawal. Some time after midnight, between 0200 and 0300 on 5 January, the covering force was hit again, this time by infantry and artillery of the Tanaka Detachment. Attacking in bright moonlight across an open field and along the road, the enemy came under direct fire from the American guns. Driven back with heavy casualties, he attacked again and again, and only broke off the action about 0500, at the approach of daylight. Later in the day the Tanaka Detachment, seriously depleted by casualties, was relieved by Col. Hifumi Imai's 1st Formosa Infantry (less one battalion) to which were attached Tanaka's tanks and artillery. By dawn of 5 January, after two days of heavy and confused fighting, the Guagua-Porac line had been abandoned and the American and Filipino troops had pulled back to a new line south and west of the Gumain River. The 21st Division on the west had retired to a position about eight miles below Porac and was digging in along the bank of the river; to the east the 11th Division had fallen back six miles and stood along a line about a mile south of the river. But the brief stand on the Guagua-Porac line had earned large dividends. The Japanese had paid dearly for the ground gained and had been prevented from reaching their objective, the gateway to Bataan. More important was the time gained by the troops already in Bataan to prepare their positions. The only troops remaining between the enemy and Bataan-the 11th and 21st Divisions, the 26th Cavalry, and the tank group-were now formed on their final line in front of the peninsula. This line, approximately eight miles in front of the access road to Bataan and generally along the Gumain River, blocked the approach to Bataan through Dinalupihan and Layac Junction. Both Dinalupihan and Layac Junction lie along Route 7. This road, the 11th Division's route of withdrawal, extends southwest from San Fernando to Layac where it joins Route 110, the only road leading into Bataan. At Layac, Route 7 turns sharply northwest for 2,000 yards to Dinalupihan, the southern terminus of Route 74 along which the 21st Division was withdrawing. Route 7 then continues west across the base of the peninsula to Olangapo on Subic Bay, then north along the Zambales coast to Lingayen Gulf, a route of advance the Japanese had fortunately neglected in favor of the central plain which led most directly to their objective, Manila. would require the most precise timing, and, if the enemy attacked, a high order of road discipline. In the 21st Division area to the west there was much milling about and confusion on the 5th. Work on the Gumain River position progressed very slowly during the morning, and the troops showed little inclination to extend the line eastward to make contact with the 11th Division. During the day contradictory or misunderstood orders sent the men forward and then pulled them back, sometimes simultaneously. Shortly before noon General Capinpin, needlessly alarmed about the situation on the 11th Division front and fearful for the safety of his right (east) flank, ordered a withdrawal to a point about a mile above Dinalupihan. The movement was begun but halted early in the afternoon by an order from General Wainwright to hold the Gumain River line until further orders. Fortunately for General Capinpin, the Takahashi Detachment on Route 74 did not advance below Pio. This failure to advance was due to an excess of caution on the part of the colonel who, on the 4th, had been placed under the 65th Brigade for operations on Bataan.17 It is, entirely possible that Japanese caution and lack of vigor in pressing home the attack may have been due to a mistaken notion of the strength of the defending forces and a healthy respect for American-led Filipino troops. Had Takahashi chosen this moment to launch a determined attack against the 21st Division he would almost certainly have succeeded in trapping the forces before Bataan. Already formed below Layac Junction when the Culo bridge was blown was another line designed to delay the enemy and gain more time for the Bataan Defense Force. The idea for a delaying action at Layac Junction was contained in WPO-3, the plan that went into effect on 23 December, and General Parker, commander of the Bataan Defense Force, had sent the 31st Infantry (US) there on the 28th to cover the junction. Responsibility for the establishment of the Layac Junction line was given to General Selleck who had just reached Bataan with his disorganized 71st Division (PA). The troops assigned were the 71st and 72d Infantry from Selleck's 71st Division, totaling approximately 2,500 men; the 26th Cavalry, now numbering 657 men; and the 31st Infantry (US) of the Philippine Division, the only infantry regiment in the Philippines composed entirely of Americans. Of this force, the 31st was the only unit which had not yet been in action. Artillery support consisted of the 71st Field Artillery with two 75-mm. gun batteries and four 2.95-inch guns; the 1st Battalion of the 23d Field Artillery (PS) with about ten 75's; and the 1st Battalion, 88th Field Artillery (PS) with two batteries of 75's. The tank group and two SPM battalions were also in support. On 3 and 4 January the 71st Division elements and the 31st Infantry moved into position and began stringing wire and digging in. General Selleck had been denied the use of the 71st Engineers by North Luzon Force, with the result that the construction of defenses progressed slowly. When Colonel Skerry inspected the line on the 4th and 5th he found that the tired and disorganized 71st and 72d Infantry had made little progress in the organization of the ground and that their morale was low. In the 31st Infantry (US) sector, however, he found morale high and the organization of the ground much more effective. ern extremity of the 71st Infantry sector was protected by swamps and a wide river; on the west was the 72d Infantry, straddling Route 110. Its sector was about 1,000 yards below Layac Junction and faced north and east. Next to the 72d Infantry was the 31st Infantry, with the 1st and 2d Battalions extending the line to the southwest, about 3,000 yards from the nearest hill mass. This exposed left flank was to be covered by the 26th Cavalry, then pulling back through Layac Junction with the 11th and 21st Divisions. In reserve was the 3d Battalion, 31st Infantry, about 1,000 yards to the rear. Supporting the 31st was the 1st Battalion, 88th Field Artillery, on the west, and the 1st Battalion, 23d Field Artillery, to its right, west of Route 110. The 71st Division infantry regiments each had a battalion of the 71st Field Artillery in support. At approximately 0330 of the 6th of January the 26th Cavalry reached the new line south of Layac Junction and fell in on the left of the 31st Infantry, to the foothills of the Zambales Mountains. It was followed across the bridge by the tanks, which took up supporting positions southwest of Hermosa-the 194th Battalion on the left (west) and the 192d on the right. The 75-mm. SPM's, which withdrew with the tanks, were placed along the line to cover possible routes of advance of hostile tanks. General Selleck did not share this optimism about the strength of his position. To him the front occupied by his troops seemed excessive, with the result that "all units except the 26th Cavalry were over-extended. "26 Colonel Skerry's inspection on the 5th had led him to the conclusion that the length of the line held by the disorganized 71st and 72d Infantry was too extended for these units. Selleck thought that his line had another, even more serious weakness, in that part of the right portion faced northeast and the left portion northwest, thus exposing the first to enfilade from the north and the second to enfilade from the east. Admittedly the position chosen had weaknesses, but no more than a delaying action was ever contemplated along this line. As in the withdrawal of the North Luzon Force from Lingayen Gulf, all that was expected was that the enemy, faced by an organized line, would halt, wait for artillery and other supporting weapons, and plan an organized, co-ordinated attack. By that time the objective- delay-would have been gained, and the line could pull back. At 0600, 6 January, when all the troops were on the line, Wainwright released General Selleck from his command to Parker's control. After notifying MacArthur of his action he withdrew to Bataan, stopping briefly at Culis where Selleck had his command post. North Luzon Force had completed its mission. Like the South Luzon Force it was now in position behind the first line on Bataan. Only the covering force at Layac Junction denied the enemy free access to Bataan. The Japanese now moved their own artillery into position. The 75's of the 48th Mountain Artillery and the 150-mm. howitzers of the 1st Field Artillery, directed by unmolested observation planes, began to drop concentrated and effective fire on the Americans and Filipinos. It was during this bombardment that Jose Calugas, the mess sergeant of Battery B, 88th Field Artillery, won the Medal of Honor. The intense Japanese artillery barrage was the prelude to an advance by the infantry. MacArthur had warned that the Japanese were "apparently setting up a prepared attack in great strength," and, except for his estimate of the strength of the enemy, his analysis was correct.29 At about 1400 a Japanese force of several battalions of infantry crossed the Culo River below Layac Junction and pushed forward the American line. Another force turned north at Layac and moved toward Dinalupihan, entering that undefended town at 1500. An hour later the Japanese who had continued south on reaching Layac hit Selleck's line between the 31st Infantry and the 72d Infantry. Company B, on the right of the 31st line, had been badly shaken by the artillery barrage and fell back in disorder to higher ground about 800 yards to the rear, leaving a gap between Company C on its left and the 72d Infantry on the right. Japanese troops promptly infiltrated. Attempts by the rest of the 1st Battalion, 31st Infantry, to fill the gap failed and Col. Charles L. Steel, the regimental commander, secured his 3d Battalion from Selleck's reserve and ordered it into the line. Outwardly the situation seemed well in hand. But General Selleck was in serious trouble. His overextended line had been partially penetrated, his reserves had been committed, and his artillery was practically out of action. The Japanese were continuing to press south across the Culo River. Should they attack successfully through the 72d Infantry line, they would gain control of the road and cut off Selleck's route of escape. Colonel Steel recommended withdrawal and General Selleck informed Parker that he would not be able to hold out without artillery and infantry reinforcements and that a daylight withdrawal might prove disastrous. At 2200 of the 6th, General Parker ordered a withdrawal under cover of darkness. The 26th Cavalry, which had not been under attack that day, had lost contact with the 31st Infantry on its right. Radio communication proved inadequate; messages were garbled and, in some cases, indecipherable. The code had been changed during the night and no one had informed the 26th Cavalry. Consequently the Scout regiment was not aware of the order to withdraw during the night. It was not until the approach of daylight that the 26th learned of the withdrawal. It began to pull back at 0700 of the 7th. By this time the Japanese controlled the road as far south as Hermosa and the Scouts were compelled to move overland across the mountainous jungle to reach the American line. With the departure of the 26th Cavalry the Layac line disappeared. At Layac Junction the American and Philippine troops had paid dearly to secure one day of grace for the forces preparing to defend Bataan. Against the longer range Japanese guns the Americans had been defenseless. The line had been penetrated at the first blow, only to be restored and then abandoned. The Japanese had once more failed in their attempt to follow up their advantage. The withdrawal into Bataan was now complete. Under desperate circumstances and under constant pressure from the enemy, General MacArthur had brought his forces from the north and south to San Fernando and Calumpit. There, in a most difficult maneuver, he had joined the two forces and brought them safely into Bataan, fighting a delaying action all the way. All this had been accomplished in two weeks, during which time positions had been prepared on Bataan and supplies shipped there from Manila and elsewhere. Not a single major unit had been cut off or lost during the withdrawal, and only once, at Cabanatuan, had the American line failed to hold long enough to permit an orderly withdrawal. The success of this complicated and difficult movement, made with ill-equipped and inadequately trained Filipino troops, is a tribute to the generalship of MacArthur, Wainwright, and Jones and to American leadership on the field of battle. and hungry. Before the fight began again they were accorded a brief rest while the enemy reorganized. To Colonel Collier this interlude seemed but an intermission between the acts of a great tragedy entitled "Defense of the Philippines." But before the curtain could go up on the second act, certain off-stage arrangements had to be completed. While these did not directly affect the action on-stage, they exerted a powerful influence on the outcome of the drama.